Posting an online ad may seem like a no-brainer, but making your ad distinctive is crucial. Your neighbors often have the same products – and they may know how to close a deal. Whether you’re advertising a job, collectibles or even yourself, you need to stand out. Be bold, but careful – follow these tips so you’re not flagged as spam or otherwise get yourself in trouble. No one will see your ad if your headline doesn’t warrant a click. Put the relevant information in those few words, but don’t shy away from a truthful description of why someone should buy your item. If you own a classic car, say so; don’t limit yourself to listing the make and year of the vehicle. Integrate the words “vintage muscle car” or “collector’s item” if that’s what you’re selling. Your description must inform potential buyers about the details of your product and weed out those who won’t be interested. Make it easy for buyers to scan your ad quickly, while putting your “best foot forward.” Follow these guidelines for a used item such as furniture, vehicles or collectibles. Photos: Include 2-3 quality pictures of the item, one from each side. Focus on clear resolution, good lighting and centering the item in each photo. Format: Write a brief, 1-2 sentence description of your item. Follow that with a bullet list of the item specifications (size, material, age). Place your contact information after the bullet list. Grammar: Run your ad through a spell-check on a word processor before posting. A simple typo might be enough to turn off a potential buyer. Take the same care for all ads, but change the template to best promote what you are selling. An apartment ad might include as many as 4-5 photos of all rooms. If you are posting a job, emphasize its perks and your company culture. This, along with a list of specific application requirements, will ensure you attract the best candidates. Remember category is important! That T-Bird in the garage could be called a “classic car” or a “vehicle.” But your buyer is the classic car collector, not the college student looking for a cheap car to get to class. Take some time to think about whom your buyer is and choose the category your buyer is most likely to search. Savvy shoppers know to be careful when entering into an online deal. ClassifiedAds.com tells buyers to steer clear of ads that ask for private information or require funds transfers. Even if you mean well, take a moment to review the guidelines so you can gain trust with your buyers. 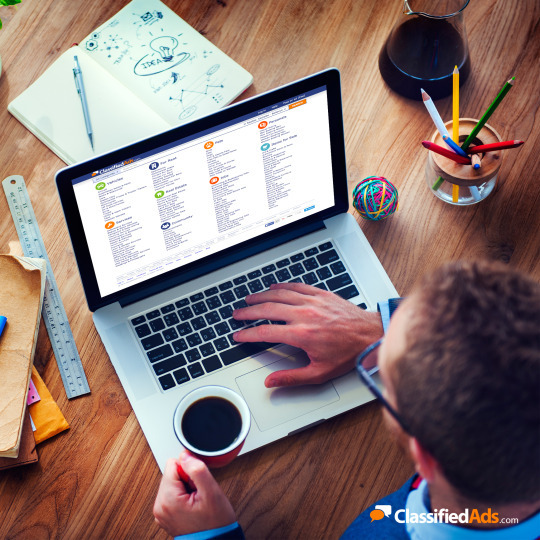 Start off by surfing the listings on ClassifiedAds.com. Chances are the ads that stick out for you will stick out to your buyers too, so take tips from those who do it right.